"Not sure if your intent was to sound pompous and insulting, but if so, you were certainly successful." Well, thank you Robyn Martin. A lovely way to begin a piece of correspondence to me in response to my Letter to the Editor which was published in the Cobar Age, Cobar Weekly and Nyngan Observer last week. Robyn is obviously passionate about the litter problem along the Barrier Highway and went on to say: "So rather then telling us stuff we already know, write a letter about littering and send it to some city papers. Don’t just target particular towns like Cobar and Nyngan because littering is an Australian wide problem, not something that only happens out here." True, it is a national problem, Robyn, but I didn’t target Cobar and Nyngan. I wrote about the litter problem along the Barrier Highway between Nyngan and Cobar. Frankly, the litter there is a disgrace, but who are the culprits responsible for it? Robyn said her family take part in Clean Up Australia Day each year, along with business houses, the local mines, emergency service personnel and many other community members in the area. Maybe Robyn Martin is being defensive because she’s interpreting my words as criticism of the clean up effort in her area. No, definitely not. Clean Up Australia Day is not a new phenomenon and neither is littering. If it was, why is the day lead by its founder Australian builder and solo yachtsman, Ian Kiernan, each year? "A couple of years ago, my family picked up 90 big bags of bottles along 15 km of the Kidman Way. I reckon that it is not the red neck locals going for a little drive out along the highways and turfing their empties out the window," said Martin. "Most of the bottles I have picked up are not beer bottles, but Red Bull and Coke bottles. "I am guessing the main culprits are travellers who are far from home and couldn’t give a rat’s about who lives outside their car window. They need a drink like Red Bull to stay awake," said Martin. It’s difficult to identify litterbugs without catching them in the act and possibly sterner penalties and signage in certain locations is necessary. Rural and outback roads are not places you expect to find rubbish bins, so it’s best if people retain their rubbish until reaching their destination and dispose of it in the appropriate manner. Would you throw rubbish around in your own home and expect a stranger to come clean it up? Wake up Australia. For more information on Clean Up Australia Day, check the website. It seems the litter problem along the Barrier Highway in New South Wales between Nyngan and Cobar is a concern. The Cobar Age and Nyngan Observer have published the writing I posted on RedBubble last week – Abusing the Australian Landscape – after I submitted it to them. Hopefully some swift action will be taken to clean up that stretch of highway because it is an eyesore. 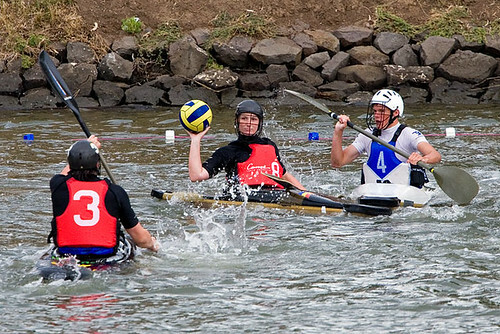 Images from the 2008 Australian Canoe Polo Championships held 21-23 March on the Maribyrnong River in Essendon, Melbourne, Victoria, Australia. Players competing in this Grand Final match are from South Australia 2 and Victoria 1. 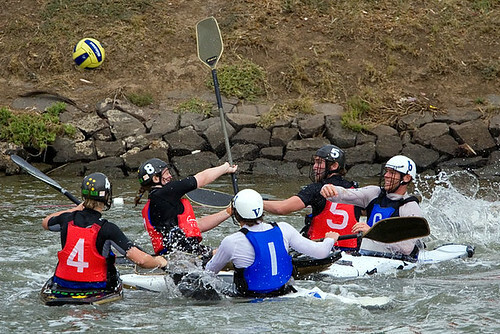 South Australia defeated Victoria in the Open section. 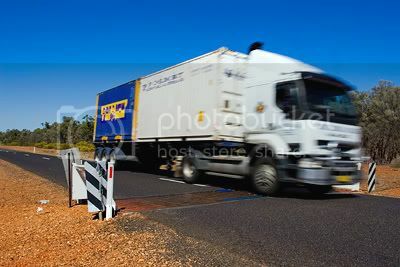 The first image in this sequence has been published on the news.com.au Leader Newspaper Group web site. 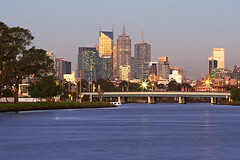 Click here to view image on news.com.au. The Melbourne Story has been officially launched at the Melbourne Museum. At the official launch, Victorian Premier John Brumby said "The Melbourne Story explores the great moments, landmarks, people and events that have shaped this city and is the single-largest exhibition about Melbourne ever staged. “It will provide Victorians, as well as the many hundreds of thousands of tourists who visit from interstate and overseas each year, with a unique opportunity to see how Melbourne has evolved since the 1800s." Museum Victoria has spent the past three years developing The Melbourne Story, and I'm pleased to inform that one piece of my photographic work is being featured in an interactive map display. 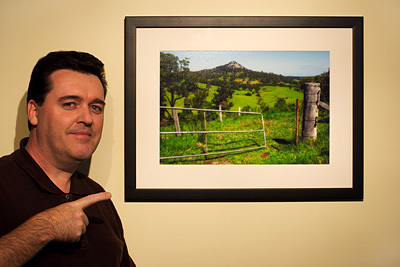 This is my image that was chosen by the Melbourne Museum and I have licensed it for 10 years. A photograph of the interactive map display can be found here. To all Melburnians, Victorians, and visitors, I highly recommend this new permanent exhibition to you. If you're looking for high-quality framed prints at reasonable prices to decorate your home, office, hotel or motel then take a look at my extensive portfolio of images at RedBubble and make your selection. RedBubble are my sales agent for supplying framed prints and their service is prompt and professional. Framed prints are delivered to your chosen place securely packaged in bubble wrap and strong cardboard. If you would like to discuss your purchasing requirements, please call mobile: 0419 200 469 or contact me by email. 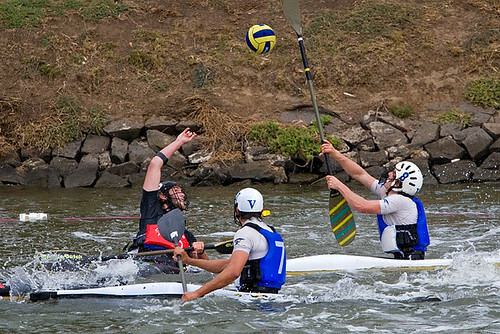 Photographic project of the Maribyrnong River in Melbourne, Victoria, Australia. 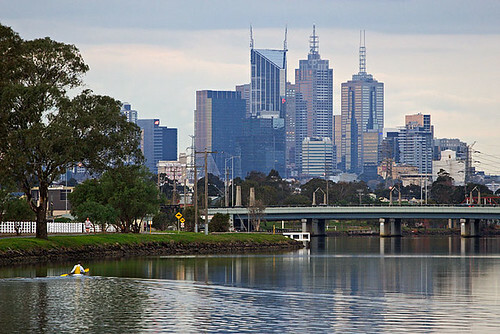 I'm undertaking an extensive photographic project of the Maribyrnong River in Melbourne, Australia for the purpose of making the photographs available for sale to stock, editorial and corporate clients. The project was commenced in June 2007 and will be ongoing due to many changes taking place along this magnificent waterway. Low resolution digital images can be viewed at my Flickr account. 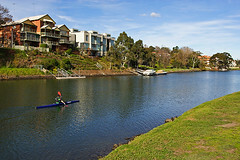 I invite interested parties to bookmark and subscribe to my Maribyrnong River Flickr gallery, and enquire by email or mobile phone: 0419 200 469 for details as to purchasing and licensing images. I've recently licensed the above image to the Melbourne Museum for 10 years and it will be appearing in The Melbourne Story in the Australia Gallery at the museum commencing March 20, 2008. The lure of the iconic Twelve Apostles is too much to resist. It's one of the most spectacular road journeys in Australia and you'll be mesmerised by its beauty. The Great Ocean Road attracts tourists from all parts of Australia and the rest of the world. I've been fortunate to meet many tourists along the this magnificent stretch of coastline and I'd like to share some of my images with you in my video presentation. Enjoy some stunning sights of the Great Ocean Road. 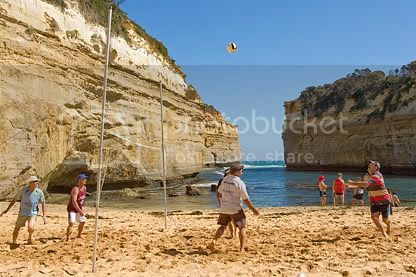 It's not all that often one sees sporting activity in Loch Ard Gorge, however it provided an ideal venue for beach volleyball and to kick-off autumn in Victoria, Australia. The Swan Hill Football Club was on its pre-season camp and Port Campbell was their venue of choice. The rugged coastline of the Port Campbell National Park and the spectacular coastal features of the Great Ocean Road is a long way from the winter fields of play along the Murray River in Victoria. The suntanned players were involved in various ball-type activities which were aimed at sharpening their reflexes and balance. The soft sand and soothing salt water are an ideal combination for young muscles in training. Other club representatives were playing beach volleyball at a skill level not reminiscent of world champions. However, team bonding is what this exercise was about in readiness for their challenging season ahead.